“Brain Age: Train Your Brain in Minutes a Day” is also known as the equally wordy title “Dr. 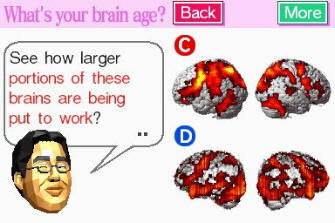 Kawashima’s Brain Training: How Old Is Your Brain?” in Europe and Australia. With the popularity of IQ tests it’s both surprising and genius Nintendo came up with this sort of educational puzzle game for the DS. After decades of exercising players’ thumbs, Nintendo is now flexing the mental muscles of over 10 million people worldwide! Brain Age is the first in a series brain-training titles making Baby Boomers and test-prepping school kids alike want to challenge themselves. The craze has been fueled largely by older players, many of whom had never played a video game system before. A little history is in order to explain where the idea came from. Nintendo was looking for something new to develop that would appeal to both traditional and casual gamers. In one of the meetings, the Chief Financial Officer of Nintendo’s Japanese division suggested reviewing a published book titled Train Your Brain: 60 Days to a Better Brain, which was enjoying a great deal of success in Japan. Satoru Iwata, the president of Nintendo, arranged for a meeting with Professor Ryuta Kawashima, the author of the book who is a prominent Japanese neuroscientist. His studies evaluated the effect of performing reading and mathematic exercises to help stimulate the brain. — As both Iwata and Professor Kawashima (who became the floating head adviser you see in-game) were too busy to meet under normal circumstances, they both agreed to meet for an hour during the Nintendo DS launch. The original meeting became a brainstorming session that lasted for three hours, in which Professor Kawashima explained the basics of his studies. Iwata assigned a team of nine developers to develop the game and to have Brain Age (known as Brain Training in Japan) ready in 90 days. Brain Age presents players with a series of fun mental brain-training challenges that incorporate word memorization, counting, and reading, that act as a treadmill for the mind. As such Brain Age is designed to be played a little each day. It even includes Sudoku number puzzles, which have become extremely popular features in newspapers around the world. The DS touch screen lets users write their responses, just as though they were using a PDA. Players even turn the Nintendo DS sideways to make it feel more familiar like a book, as well as allowing both right- and left-handed people to hold the DS the way they prefer. The more often users challenge themselves, the better they become at the tasks and the lower their estimated DS “brain age” until it reaches a perfect brightness score of 20 years old, which I believe is about the age when your brain weighs the most. There are five modes of play: Brain Age Check, Training, Quick Play, Download Play, and Sudoku. The Brain Age Check gives you three puzzles to complete each time. The following puzzles will appear at random. During the Stroop Test, the game will display one of four words: blue, black, yellow, and red, and you have to say the color into the microphone, but not the word, which is also a color name. Other puzzles include Speed Counting from 1 to 120, Word Memory where you remember as many of the 30 words as possible in two minute and then write them down on the touch screen within three minutes, in Connect Maze you connect letter and numbered dots in the right order in a maze. A favorite is 20 Calculations to do ASAP. And then there’s Number Cruncher where many different colored numbers show up that all do different actions and you have to answer a question like the Calculations test, but mixed with the Stroop Test, so you could have different colored numbers moving all over and you have to be fast to answer “how many blue numbers are there?” Your progress gets recorded in a graph, so you can see how your brain age improves over the days. The Training mode lets you play the nine various puzzles one by one and after you complete one you’ll get a stamp of approval on that date (you can play each one as often as you’d like to improve your skills) on the calendar that gets bigger when you train with at least three different puzzles that day. It’s not just more of the same skill level, you can go from Calculations X 20 to Calculations X 100 and on that last mode you can go into a Hard Mode, which adds division problems to ramp up your brain activity. For variation you get puzzles like Reading Aloud, which gives you an excerpt from a story like The Legend of Sleepy Hollow that you have to read aloud to see how quickly you can do it. At the end of each puzzle you’ll be told what your skill level is. Quick Play can be played without save file, as a result it gives you one of the easy puzzles from Quick Brain Age Check, Quick Training, and Quick Sudoku to try out. At the end of each puzzle you’ll be told your brain age or time. Up to 16 people can play with a single game card via Download Play, and each activity takes less than a minute to complete. But you’re probably going to end up sharing your game cartridge with two friends or family members to see how they compare with you in the graphic representation of your in-game progress. The Sudoku mode has more than 100 puzzles across three different modes – Beginner, Intermediate, and Advanced. Sudoku involves a 9×9 grid, which features numbers in every square. Some of these numbers are visible, while others are not. The objective of every Sudoku game is to fill in each square with the correct number using the visible, pre-written numbers to guide them. Each row and 3×3 grid has nine squares in it, and each row and 3×3 grid must have one of every number in the 1-9 range. Ideally, a completed Sudoku puzzle should have nine of all of those numbers in the 9×9 grid. Alternatively, when you turn on Brain Age you can be asked to do a Picture-Drawing Quiz, which requires the player to draw a person, place, or thing by memory using the touch screen. After the player has done all three, the game will compare his or her drawing to an example to show you were your memory can improve. Once in a while you’ll even be asked to do a Memory Quiz, which requires the player to recall a recent event, such as what the player ate or the most interesting thing you saw on television the day before. Several days later, it will ask for the answer you provided, and will then compare the answer given several days ago and the answer given on the current day to test your recollection skills. In conclusion I’d like to point out a few minor weaknesses in the game. Sometimes when you rush your handwriting during a calculus test the game won’t recognize it or misread your writing. And it’s pretty hard to pronounce the color Blue the way the game wants you to voice it with a different intonation than most people say it, Nintendo explains this by mentioning “sometimes pitch, clarity, ambient noise, loudness and regional accents can affect results all voice recognition software takes a little getting used to.” But even if you don’t, luckily the game gives you the option to say you can’t talk in public, so it’ll skip the voice section of the test that way. But otherwise there’s really nothing to complain, when I can get my casual gamer friends and non-gamer parents to try this out and like it, well it’s no surprise it’s become a hit. So how much fun is Brain Age on a scale from 1 to 10? If it’s not for you, you’ll know after a few minutes. You have to enjoy a game that instantly makes you feels smarter the more tests you do. Especially after a few weeks and months of keeping it up you become a lot better at logical puzzles, math, and handwriting. This is so much more than the sum of its parts, refreshing and great fun entertainment for everyone. The in-game graphics are simple, but that’s just perfect for the puzzle tasks. Minimal is what it is, but again that’s just perfect for the puzzle tasks. Who thought math, puzzles and brainteasers could be so much fun even if they aren’t normally your cup of tea. The package is so well put together with the stylus pen controls integrated in such an easy way, that almost every task feels fun to do. There’s still some room for improvement in the handwriting and voice recognition, which is why it isn’t perfect, but that’s what sequels are for. It took me over a month to get to a 20 score and it kept me playing for another month. But it was great fun and a year later I’m actually getting back into the game. Even if you only do it for a few minutes a day, you’ll have plenty to do. Need to keep that brain smart, you see.